Limited construction area and entrenched social disparity has created the split level marketplace, the Day Market and Night Market. The Day Market is a beautiful and well-patrolled street where only well-to-do merchants and nobles are allowed conduct business. Below, the Night Market is a grimy and sun-less canal where commoners eke out a living and criminal gangs operate with impunity. However the strict separation is not complete. Secret passages, laborer access, and cellars allow for a variety of paths up and down. This ease of travel means the fights and chases spill into multi level conflicts. A) This warehouse is a front for drugs and luxuries the local nobles sneak into the city. Evidence of the city's social disparity and rampant bribery, the city watch looks the other way. C) The main ramp that connects the Day Market to the Night Market is guarded by the adjacent watch-house, "fees" are frequently collected on Night Market commoners or entry denied entirely. D) This stable for Day Market pushes into the Night Market, but keeps the fine horses out of reach of the lower rabble. E) Bartholomew Brae's Quality Accommodations for noble clientele is an immaculate inn with a price to match. I) This Day Market alleyway has a secret ladder to the Night Market, the lower entrance is concealed by fungal growth from the canal. J) Karth's is a popular Night Market bar known for it's grumpy halfling namesake and the spiciest food in the city. K) The city watch holding cells are open on one-side to make an example of those who do not know their place. L) Bart's Flophouse is a filthy bunkhouse. Bart "graciously" lets his laborers stay for regular price. Congratulations, Bryce. Putting yourself out there to compete in anything is hard, and designing RPGs is hard. Particularly designing adventure settings or locations. You have to be able to suggest some ideas about personalities, plots, terrain, and more, and have GMs chomping at the bit to add your location to their regular game. Let's see how you did! I believe in positive feedback and honest criticism that should make you better at every part of this gig. So to start positively, I want to say kudos for referencing chase scenes. I think it's an under utilized trope in Pathfinder and your split level canal marketplace certainly begs for exactly that. I can see a parkour-style chase that moves up and down the floors and exposes the party to a grand tour of the night life of both the wealthy and poor. That exciting element aside, if I were developing this text for a publisher, I'd want more details about the individual encounters available, and a few suggestions on the kinds of encounters that could set off that chase. I'd also have a ferry or gondola travelling through the canal to involve a moving platform on the water. The good news is you've got me thinking how to make it memorable and serve a variety of moods. The bad news is that after you inspire me I'm doing to other work myself. I don't love your naming conventions. Day/Night Market could be something cleverer that suggests opposites or tiers. Bartholomew Brae's Quality Accommodations is long and uses four words. A flashy nightclub-esque name could let you spend words on somewhere else and contribute to immersion (after the festival , we're staying at Alchemy tonight!). You list a Bartholomew and a Bart's. Don't talk to me about "a Night Market gang". Tell me about the Duskwarden guild. I know in a contest like this there's only so much wordcount to go around but the best designers we all know and patronize can do it so we have to rise to the occasion and learn from them. Once you offer me an exciting idea, fill it with exciting details and don't rely on me to run with it. Still viewing that chases scene. Up down, across and back, fighting on the gondola as it moves though the canal. Great job on producing excitement. Good luck the rest of the contest. This adventure location presents a duality between the “haves” and “have nots,” and a GM could mine it for all sorts of conflicts involving PCs. This is a well-worn trope, but it is possible to take a unique perspective on it. You reference the idea of multi-level conflicts where PCs and their foes can use ladders, grates, and secret doors to move up and down between the markets, so that provides a great three-dimensional aspect to this location. I realize you only have so many words to describe the location, so I think you would have been better off skipping some of the more generic locations (F and H, for example) so you could use those extra words to add flavor to the existing locations. You mix named places with generic places, and I think you would have been better served to own the adventure location and name everything. Most GMs, even those who would use this map to make up their own details, would be more inspired by “The Picklefish Emporium” rather than “This Night Market fish shop.” Steve already mentioned naming the Night Market gang as another example. The map does a good job of laying out the two markets, and it makes it clear the two markets are stacked atop one another. It looks like a pair of marketplaces, and I think a cartographer could design something from this. There are a couple of locations that needed some additional clarity. For example, I admit to some confusion about the yellow shading for area “D” and below it (are those stalls for the stables?). Overall, this location has potential for some innovative combats involving the layered markets, as well as conflict between the two markets. It comes across as overly generic, when it should have a stronger identity. Therefore, I can’t recommend this to advance. I wanted to read and comment every entry before I gave a thumb' up or down recommendation. I am supporting FOUR entries to advance from this round based on map, adventure potential, and quality prose. And I can't recommend this one to advance based on my comments above. 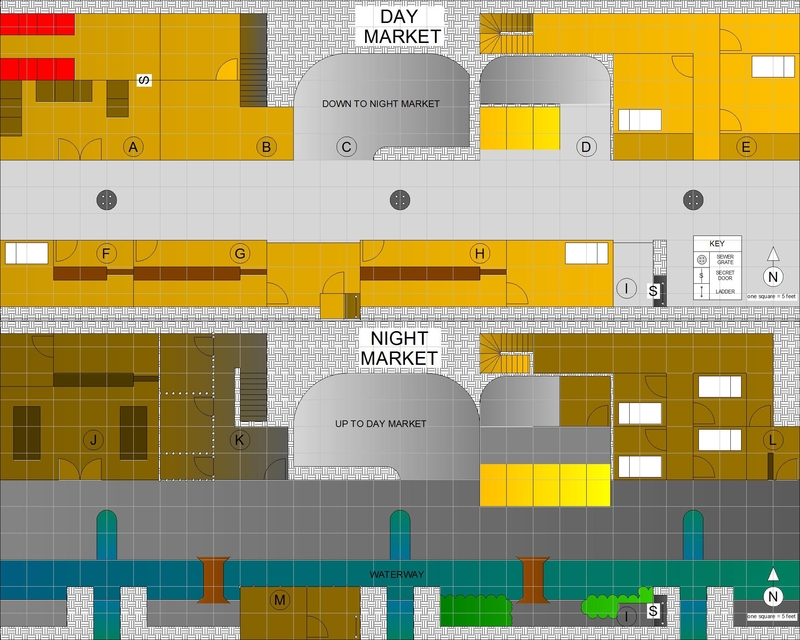 A dual-level market isn't a unique fantasy location, but it's one that works because it offers so much potential. And I very much see that potential in the Day Market and Night Market. Unfortunately, in this case, I think it may have had too much potential for this challenge. I'm a big fan of Food Network's "Chopped" and I always get frustrated when the chefs try to make risotto or panna cotta when there simply isn't enough time to do so, and this I think falls into that trap, in that the write-up includes so many individual stores but doesn't have the word count available to make them all sing. I love some of the ideas -- like the inn and flophouse presumably being run by the same person and what does that say about that person -- but I think maybe trying to give more of the overall feel and just a few highlights of specific/more exciting places might have let the whole place sing a little more. Mike and Steve have noted a few issues with the writing, but another one that caught my eye is a little inconsistency with how the two markets are referred to: Area D is a good example where the write-up uses the definitive article ("the") before Night Market but not Day Market. The map itself has a somewhat similar problem. While I think it makes the most of the space available, it's still trying to cram in two levels of features on both sides of the road/subterranean canal. That means, for example, Bartholomew Brae's Quality Accommodations has only two beds, which seems too small. While I think a cartographer would be able to make a nice map out of this, I think a GM would be left needing more information to really use the area. I'm very torn about this one because I like a lot of the ideas and it has me thinking about what this location could be (shopping is often written off as a between-sessions activity and this could make for a memorable place for that to happen in game), but it just attempts to do too much in the space it has available. Word count is one of the hardest elements to juggle in game writing and self-editing is a big part of the design process. In the end, I'm afraid I'm on the fence for this one. Thank you Famine, MDwelham, and Motteditor for your great advice and feedback. The community comments were what I was looking forward to the most on this round and you did not disappoint. Congratulations on successfully completing Round 2. Presently, yours is the first map I am looking at, so I am not going to give any indication of how I am voting until I look over everyone's obviously, so I can't give any plus, minus, or on the fence statements at this point. First, from the standpoint of a submission to the publishing cartographer: This map is clean and easy to understand. Obviously, using a program with well-known symbols is just going to make it easy, that's what they're there for, after all. I don't think any cartographer or even reader looking at this would have problems determining what anything is. Having said that, I am almost disappointed that there isn't a single object or feature that required more detail or actual clarification. Not a statue, a strange sigil, or other object that couldn't be done with a program. Basically that left you with just detailing out shops and the quality of their services. Second, from a exciting adventure or location area standpoint, I can envision several encounters I could use here, but to me, without the in-depth and location flavoring you've added, it's a two-tiered street with only a canal as a unique battle or terrain feature and the fact that it's two-levels, which is neither good nor bad, but no different than an encounter in a two-story building (and not even one with an overlooking gallery where the two levels could really interact between each other). At its base, the map reminds me of Riften from The Elder Scroll's Skyrim (the location of which I am fond of). However, despite indications of battles or chases moving between levels, I just can't picture that. Any fight that tries to span the two levels will either use the main ramp, which is so close to the watch-house that it would likely not really occur or if it does it would be ended quickly by NPC interactions, or it would have to be a battle or chase up or down a secret ladder in a few shops, which I don't ultimately imagine as 'an exciting chase' ("I go up the ladder one level"). That leaves the walkway past areas E and L or the stables (which is basically the main ramp). Otherwise it's a straight row of shops, one on top of the other, with no real way to interact with each other without going from one level to the other. A person in Night Market can't fire a bow at the Day Market, a chase from one to the other is just like a chase down any long street, there's no leaping from one level to the other or scaling scaffolding or girders to differentiate it from a location inside a building. And while I understand the map size and shape restrictions (and having to use half the space for each level of the market), we've just got a long street as an encounter. There's few places where someone lurking or holed-up in a shop can say, snipe or fire arrows anywhere except at targets basically standing in front of the building they're in. For an overall comment, for me, I try not to weigh too heavily on story and such (for purposes of this challenge) so the details on the gangs, the locations, and motivations of shop owners are not something I judge too harshly or critically. You added a lot of details to give flavor to the typical inhabitants to be found here, and that's fine. As pointed out by mdwelham, you kind of mixed specific and generic shops in with each other and that was jarring to me. You go to lengths to name some, but then leave others as 'A quality good shop.' Word-count notwithstanding, it wouldn't be to hard to call it '[Someone's] Quality Goods' or the ever popular '[Adjective] [Noun] Supplies'. It's in the Day Market, there's been plenty of indication of the quality of shops there, I don't need to know the quality of its goods (especially not if you put that in the name), only if for some reason it was shoddy, but that's not even as important to me as it has no actual effect on the map. Again, it doesn't affect my personal view of the map as an interesting location, but it's jarring as I look over it and see some places that have names and others which remain vague for no discernible reason or difference. Also mentioned were areas E and L (Bartholomew Brae's Quality Accommodations and Bart's Flophouse). As a GM, I want to think the owner is the same person, but I'd appreciate an indication one way or the other, like a mention that the owner of E is at least a halfling. Otherwise I don't know if you're hinting or whether you just messed up and made two really similar owner names. It wouldn't count against you if you hadn't gone into such details on locations. I am inclined to think the owner of both is the same person, because of the one problem I have with the map, which is how the two locations are laid out. It appears that both E and L have an alley or walkway through them that allows access between upper and lower market. I am fine with that kind of drive up motel, office is separate from rooms layout for a flophouse, but having a quality accommodation where any grimy peasant could stroll up and past the apparently unconnected rooms of area E makes me pause and try to figure out the mechanics of it.